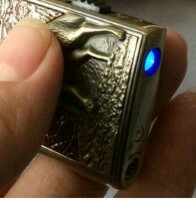 The Wolf copper tone Lighter is really cool. It has a wonderful metal copper tone howling Wolf on the front against an alligator look skin. It is a gas lighter that is refillable by the receptacle on the bottom of the lighter. There is an on/off switch on the side of the lighter which turns on the penlight at the bottom of the lighter. The lighter is shipped to you at the lowest flame setting and can be adjusted at the bottom of the lighter using a small flathead screwdriver. This would make a wonderful Father's Day gift for a Wolf fan.